Cattaneo Commercial has completed the sale of 1 Kings Road, Walton on Thames, Surrey KT12 2RA and achieved a record price per square foot for the area. 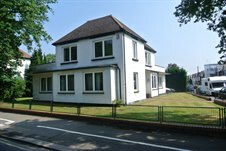 This attractive, two storey office building is prominently situated in it's own grounds on the junction of Kings Road and Hersham Road and was sold to an investor. If you are thinking of selling your property, we are currently experiencing a strong demand for freehold commercial buildings, so please do not hesitate to contact Andy Armiger on 020 8546 2166.